Bing’s not-so-newest push into online travel hasn’t begun to roil the industry, the latest example of where if Bing does something, no one cares, but if Google does it, it’s time for a Wall Street Journal story examining the potential evilness of the move. In case you missed it, the Wall Street Journal has a story out about how Google’s travel results — added in September, rather than December as the story says, have upset (as you’d expect) rival travel search engines such as Kayak, Expedia and Orbitz. Microsoft’s Bing, which has less than a quarter of Google’s audience, also places its flight-search tool atop search results. That’s all you get, too. There’s no mention of any of the travel sites being upset with Bing, perhaps finding this unfair or having gone on for literally years before Google did the same. There’s also no mention that Bing has used having its own travel search results as a way to position itself as better than Google, an important fact in any debate on this issue. You’re planning a trip. First stop, Bing. ‘Cause any search engine can help you find a plane ticket. But Bing, with Price Predictor, can help make sure you don’t pay too much. Microsoft’s research identified shopping, travel, local business and information, and health-related research as areas in which people wanted more assistance in making key decisions. The current state of Internet search isn’t optimized for these tasks, but the Bing Decision Engine is optimized for these key customer scenarios. For example, while a consumer is using Bing to shop online, the Sentiment Extraction feature scours the Internet for user opinions and expert reviews to help leverage the community of customers as well as product experts in trying to make a buying decision. In Bing Travel, the Rate Key compares the location, price and amenities of multiple hotels and provides a color-coded key of the best values, and the Price Predictor actually helps consumers decide when to buy an airline ticket in order to get the lowest prices. In fact, some analysts see Google’s move into travel as a direct reaction to the offerings at Bing, Microsoft’s search engine. Some of Bing’s features, like travel search, “have put some pressure on Google” to innovate, wrote Douglas Anmuth at Barclays Capital. As for who exactly is upset, only Kayak gets quoted with slams against Google. 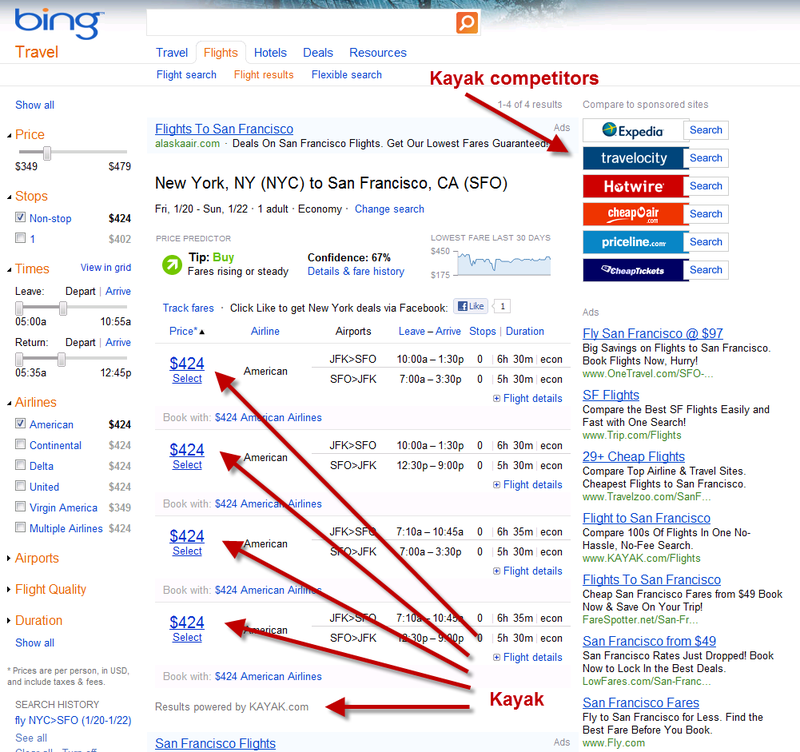 Kayak doesn’t have any slams against Bing, perhaps because it partnered with Bing in May to help it do exactly what it doesn’t like Google doing to other travel search engines. Also not mentioned is how in March, Kayak’s chief technical officer dismissed concerns about Google entering the travel search space. While Google wasn’t required by the DOJ to link directly to the travel sites, it emphasized that it would “build tools that drive more traffic to airline and online travel agency sites.” Competitors say that Google is now violating the spirit of that commitment. Google acknowledges it has failed to make good on assurances it would link to the travel sites, but the company says it had no choice. “The airlines told us that they would not give us [travel data] if we provided booking links to” online travel agencies, Jeremy Wertheimer, ITA’s founder and now a Google vice president, said at an online travel conference last month. He added that Google still wants to include travel sites, and “we’ll keep knocking on that door to see if things change.” A Google spokesman declined further comment. So Google is linking, just like Bing does, to other travel search engines. What exactly is, then, this promise that it’s not delivering on, which is a key allegation featured in the Wall Street Journal piece? Our goal is to build tools that drive more traffic to airline and online travel agency sites where customers can purchase tickets. We also believe that giving users better ways to search for flights online will encourage more users to make their flight purchases online, which will create more overall online sales for airlines and travel agencies. Google does not plan to sell airline tickets directly. In the example above, you can see how selecting the “Book” button only allows booking through American Airlines — and only because, as best I can tell, American is paying to have that happen (hence the ad being shown). In some cases, we may be unable to connect you directly with a vendor to purchase your ticket and as a result, the Book button will be inactive. If this happens, you should repeat your search on the airline website, or, particularly in the case of a multi-airline flight, repeat your search with an online travel agent. Potentially, only including booking links if being paid for them is a violation of the Federal Trade Commission’s guidelines on paid inclusion (see Google Experiments With Paid Inclusion & Does “Promoted” Meet FTC Guidelines? for more about this). It’s hard to say, because the airline’s route is listed without payment, so it’s not exactly a case of paid inclusion. The first arrow shows what happens if (as I assume) an airline doesn’t pay to have the Book link enabled. You’re told to contact the airline directly. The second arrow shows that the travel search tool does send traffic to the non-Google travel search engines. There’s an ad at the bottom of every page I do listing them. I assume they’re paying to be there, and if they don’t pay, then they wouldn’t show up. Of course, for them to show up for free would be a nice boon to have. And for consumers, it would probably be nice as well, since the tool’s booking feature seems to be pretty weak. But when the same exact thing happens at Bing, except in favor of Kayak and only blocking Kayak’s competitors from being listed for free, that’s apparently OK. Or not, at least, worth a mention. The more that search engines start diving into providing direct transactions or being transaction brokers, especially where they might charge providers a fee through ads or by taking a share of sales, the more any publisher should be concerned. But that problem isn’t a Google-specific one and shouldn’t be treated in that manner. Otherwise, potential abuses by Google get stopped but others are free to do the same. Google Experiments With Paid Inclusion & Does “Promoted” Meet FTC Guidelines?